MORE SUPER HITS OF THE SEVENTIES! Font size="+1" Font size="+2" Font size="+3" Font size="+4"
MIKE-SHELL PRESENTS - MORE SUPER HITS OF THE SEVENTIES! Welcome to the headquarters for information about Michael Shelley's 2014 WFMU Fund Raising Premium CD "More Super Hits Of the Seventies!" 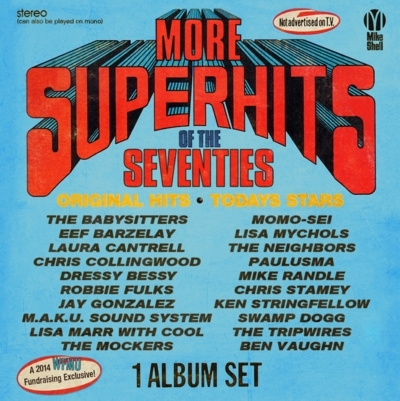 This amazing collection has 20 guaranteed #1 hit songs from some of the greatest music makers of today covering top forty hits of the 1970s - and each one has been recorded EXCLUSIVELY FOR THIS COMPILATION! All of these recordings were made just for the 2014 WFMU fundraiser and were available ONLY with a pledge to the 2014 WFMU fundraiser! 1) The Babysitters "Magnet And Steel"
2) Eef Barzelay "How Can You Mend A Broken Heart"
5) Dressy Bessy "What Is Life"
6) Robbie Fulks "Sally G"
CLICK HERE for step by step details about how to get your copy of MORE SUPER HITS OF THE 70's ! CLICK HERE for the free 18 page LINER NOTES to "More Super Hits of the Seventies!" 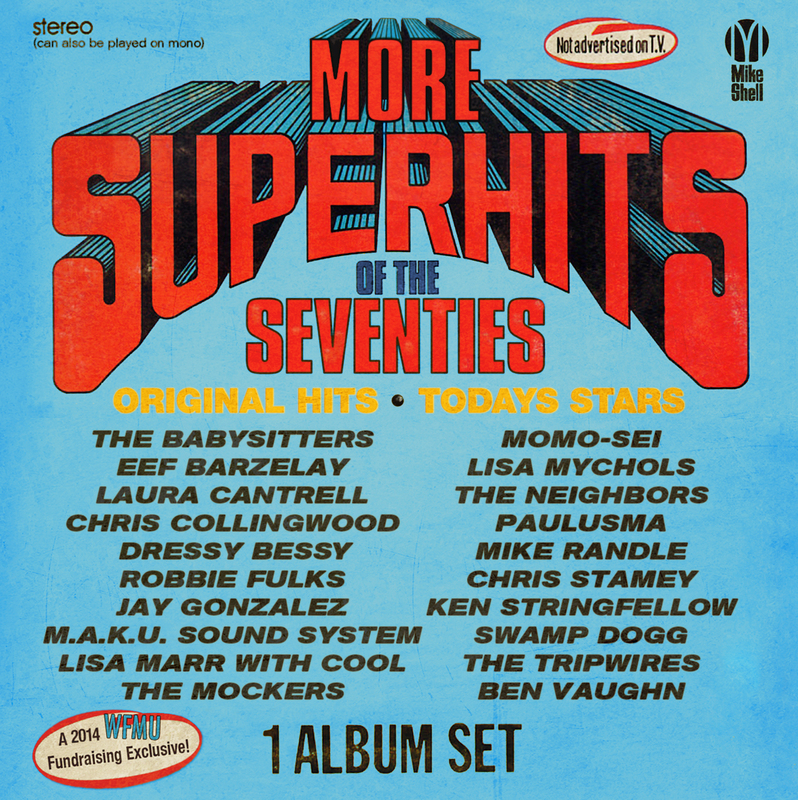 CLICK HERE to hear clips from the first half of the songs on MORE SUPER HITS OF THE 70's ! 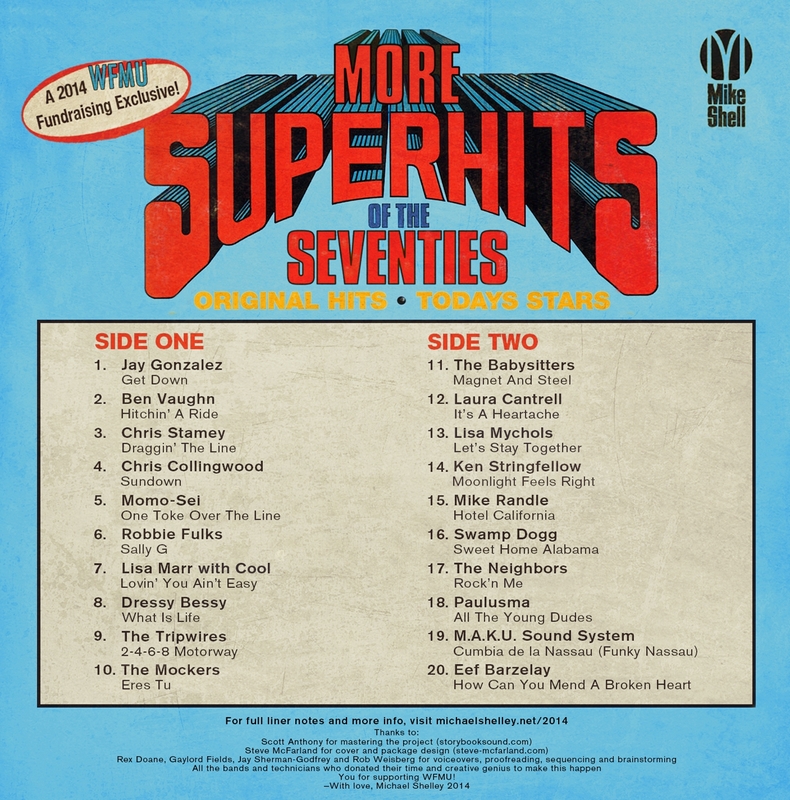 CLICK HERE to hear clips from the second half of the songs on MORE SUPER HITS OF THE 70's ! CLICK HERE to see the cover of the 1975 K-Tel LP that provided inspiration compared to the Mike-Shell version! CLICK HERE to see the 1975 K-Tel commercial that provided inspiration! CLICK HERE for information on the first volume in this series "SUPER HITS OF THE SEVENTIES"
-Scott Anthony at Storybook Sound for mastering the project! -Steve McFarland for the package design & amazing Photoshop work on the front cover! -Adam Oelsner for the video editing! -Jay Sherman-Godfrey who helped me sequence both volumes of this series! -WFMU's Rex Doan for his voice over work! -WFMU's Gaylord Fields for proofreading! -WFMU's Rob Weisberg for his helpful brainstorming efforts! -All the bands and technicians who donated their time & creative genius to make this project happen! -You for your pledge to the 2014 WFMU Fundraiser! CLICK HERE for the MICHAEL SHELLEY RADIO SHOW home page! CLICK HERE for the MICHAEL SHELLEY NON RADIO SHOW home page!